As a Culture, we have a real opportunity to make changes from the ground up, and that means starting with our children. Countless studies have shown that Meditation has positive effects on both the brain and the whole body’s ability to deal with stress. This isn’t even bringing Spirituality into the conversation. Meditation is good for you. 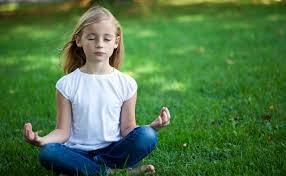 I am both the Mini Me Yoga Ambassador for Canada and a Certified Facilitator of The Max Meditation System TM. I have stated in all the information I give to potential clients, that our program is a gentle, heart-centered program that is not rigid. We don’t want or need the kids to do “Perfect Yoga”. We want them to be able to enjoy it and feel safe exploring! For many children, Mini Me Yoga is their first experience with Yoga and we want them to enjoy it so the principles of deep belly breathing, relaxation and meditation stay with them! I fell in Love with Mini Me Yoga when I first attended my Facilitator Training. I was relaxed, happy and open. I have giggled so many times, when adults have told me the same thing when I’ve taught Facilitator Classes. I’ve had requests for Adult Mini Me Yoga Classes! We have a Yoga portion, but also a Meditation portion too. Giving children a chance to gently connect to their bodies and souls is so important! The reason our program isn’t rigid is that we are in the Love Business. We want our children breathing, and relaxing into their Hearts and bodies without fear, shame or guilt. We want the children loving and accepting themselves, just as they are when they come to class. As you may see from my profile picture, I don’t have a “standard yoga body”-whatever that means. I am short and curvy, like many women and girls. Kate Bartram-Brown, our founder, is committed to Mini Me Yoga as a safe space for everyone to come and be exactly as they are, and know they are enough. I am on the same page as my good friend, Kate! My Mission for Mini Me Yoga in Canada is the same as it is in 23 other countries around the world. We want kids relaxed, happy, joyful and loving themselves! We also want the adults who attend Facilitator and Ambassador Training to know they are enough and just the right size, shape, and kind to teach Mini Me. What matters to us is that you are a Heart-Centered person. I will not train anyone who isn’t.